Courtesy of Dr. Ole Isacson, McLean Hospital and Harvard Medical School. 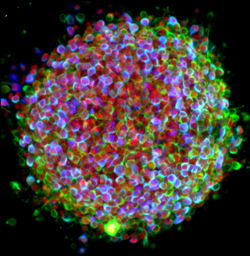 Certainly – as you can see here – stem cells are spectacularly beautiful. But they also hold spectacular promise for medicine. That’s why I immediately expressed my enthusiasm for Monday’s Supreme Court ruling that effectively enables NIH to continue conducting and funding responsible, scientifically worthy stem cell research. There are many kinds of stem cells. This is a picture of induced pluripotent stem cells – or, iPS cells. Investigators have recently begun using iPS cells to model several neurological diseases – including Parkinson’s. The cells here have been treated with growth factors that coax them into becoming the dopamine producing (dopaminergic) neurons lost in Parkinson’s. The colorized markers indicate the presence of three proteins found within dopaminergic neurons: (1) the enzyme needed to produce dopamine (tyrosine hydroxylase, in blue), (2) a structural protein specific to neurons (Type III beta-tubulin, in green), and (3) a gene regulatory protein needed in dopaminergic neurons (FOXA2, in red). The color-mixing in some cells indicates that all three proteins are present – confirming that these cells are on their way to becoming dopaminergic neurons. Today’s image is more than just a pretty picture. It’s a window into the ways that disease affects the body – and possibly the ways we might counter those affects. The NIH/NINDS web site has more information about how iPS cells are being used to study Parkinson’s and other neurological disorders.